For a long, long time, I had an aversion to buffalo chicken wings. It’s a sad tale really, when I think about how the aversion arose in college, many hours spent at Happy Hours, and I was missing out on this classic pub grub. It’s not that I didn’t enjoy the taste or flavor, quite the opposite, but I couldn’t stand sitting at the bar or a restaurant and my hands being covered in buffalo wing sauce. Years later, like ten years later, a friend told me how silly my logic was considering how much I enjoy picking blue crabs. They had a point, and I had to figure out a way to enjoy buffalo wings. The key for me – making them at home. I can get messy, there is sink with soap right in the kitchen, a plethora of paper towels, and if wing eating really goes awry, there is a washing machine. I prefer my wings grilled, so I didn’t really have to worry about frying them. I was worried about grilling them, getting the skin nice and crispy, only to discover I may have to grill them within an inch of their lives. 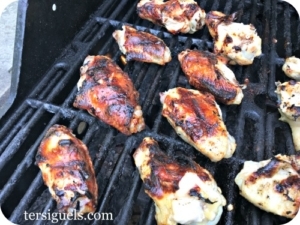 Chicken + grilling = must marinade. The morning of the day before I wanted to grill these guys up, I grabbed one of the bags of wings I prepped a few weeks back and put it in the fridge. The next morning, I pulled them out of the fridge and using the same zip top bag, I added buttermilk, salt, pepper, and avocado oil. I closed it back up, shook it to be sure all of the chicken was covered and put them back in the fridge it went. Buttermilk is one of the simplest ways to keep chicken juicy and flavorful. It technically could qualify as the simplest, but I recognize most people don’t keep buttermilk in the fridge. Some great substitutes are sour cream or greek yogurt. I dreamt all day about grilling these wings. And it was finally time. At dinner time-ish. I lit the grill. I grabbed the wings from the fridge and set them out to allow them to warm up a bit, so I wasn’t putting them directly from the cold fridge onto the hot grill. Back in the kitchen, I cleaned some carrots and celery and trimmed them up for a classic preparation. I also got out the trusty butter, and good ole Frank’s Hot Sauce. On the stove, I melted a the butter and add the hot sauce, and whisked them together, and removed from the heat. Back the grill. I put the skin side down first, closed her up and headed back into the kitchen. I like blue cheese with my wings, but I don’t like to buy blue cheese dressing. I prefer to make it at home. Pioneer Woman has a great blue cheese sauce. It’s easy to make and it’s my go to recipe. You can find it here. Gotta check on the wings, and turn them. Twenty minutes later, and one rye whiskey, the wings are looking great. I took a large melamine bowl and the wing sauce out the grill with me, and mixed everything together right there. Man, just writing this is making me want wings for dinner. Melt the butter, add the sauce and whisk together. In a zip top back, combine all the ingredients. Let marinate from a minimum of thirty minutes, and up to overnight. Preheat the grill. While preheating, remove the wings from the fridge to bring them up in temperature. Place the wings skin side down to start. Grilling on each side 10-12 minutes. Once removed from the grill, coat with the sauce. Serve with carrot and celery sticks, and blue cheese dressing.